← Media Advisory – HandyDART Riders’ Alliance Spokespeople available to comment on Metro Vancouver HandyDART Service disruption. Vote YES! 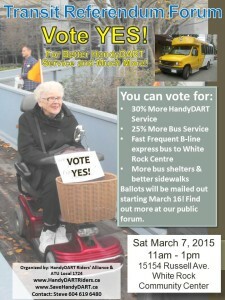 For Better HandyDART Service and Much More! Ballots will be mailed out starting March 16! Find out more at our public forum. HandyDART service hours have been frozen since 2009, and as a result trip denials went up over 600% before the contractor changed procedures to disguise the crisis. Service quality has also deteriorated, with riders routinely forced to wait for hours. The Mayors’ Plan includes a 30% increase in HandyDART service hours over 10 years, or about 2.7% per year. This is an important step forward, although considerably more is needed after a 5-year freeze and given our rapidly aging population. It is time to make major investments in public transit, including HandyDART, to make Metro Vancouver a livable and age friendly region. Please Vote YES! Download and print a poster!